Here in the United States, all we have to do is turn on a tap and the clear, crisp water flows freely into our glasses, pots, pans and buckets so that we can hydrate ourselves and cook and clean to our hearts’ content, but what happens when the pipes in your multi-unit residential building burst, and you are forced to temporarily turn off the water? 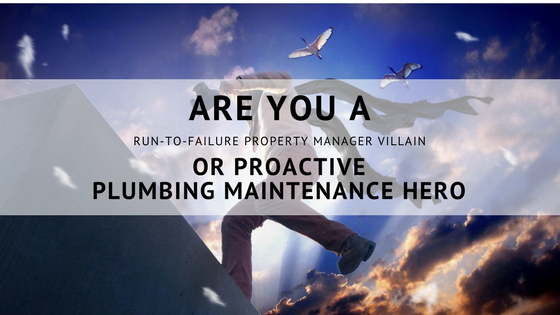 Depending on how you handle the situation, you could be your tenants’ run-to-failure villain or proactive plumbing maintenance hero. To be your Chicago tenants’ run-to-failure villain, all you have to do is be the property manager that sits back in the office and waits for things to fail. In the case of your potable water pipes, this means waiting until your residents start complaining of water pressure drops, water spots on the ceilings and active leaks before calling a professional plumber. Once you get enough complaints and see enough water spots, call your local 24-hour emergency plumber, who will charge you by the hour and for every plumbing pipe and part used. If you happen to call after hours or on a weekend or holiday, you can expect to pay even more. Once your emergency plumber in Chicago arrives at your building, he or she will turn off the water to part or all of your building while the repair is being made. If the plumbing pipe is behind a wall or in the ceiling, the finishes and drywall will be removed so that the plumber can reach the pipe, remove it and replace it. When the plumber is finished, you will have to pay the plumber from your emergency or yearly maintenance budget then find contractors to remove the mold and mildew and replace any water-damaged drywall and finishes. Then, wait for the next failure. Following these steps virtually ensures that you will be your residents’ run-to-failure property manager villain! Thankfully, you don’t have to be the run-to-failure villain. Instead, you can be your Chicago tenants’ proactive maintenance hero by fixing plumbing pipe problems in a timely manner and taking steps to prevent future plumbing pipe failures. The first step to being a hero involves calling for an emergency plumber the minute your maintenance staff or residents’ inform you of a water pipe leak, water spots or puddles where they should not exist. When you call for an emergency plumber as soon as possible, you are helping to limit the amount of water damage in your building, and you are having the maintenance issue fixed in a timely manner, which means minimizing the time your residents are without running water. As a Chicago property manager hero, your next task is to prevent future water pipe breaks. This is because you realize that all the pipes in your building are about the same age, and if some of them are starting to fail, they will all fail within a relatively short timeframe. To prevent more plumbing pipe failures, you may want to consider blow-in epoxy pipe lining, which can stop further corrosion and seal small leaks so that you can continue to provide your residents with clean, running water. Here at Nu Flow of Chicago, we can inspect your current plumbing pipes and tell you if you would benefit from our pipe lining services. It all starts with a building pipe assessment, which includes a camera inspection, a go/no-go decision on pipe lining and an estimate if your plumbing pipes would benefit from epoxy liners and/or coatings. To learn more about our blow-in epoxy coating and CIPP pipe liners, call us at 815-790-9000. We serve all of Chicago and greater Chicago, including Hammond, Orland Park, Oak Lawn and Joliet.